I finally finished "fixing up" the pictures from our stroll down the beaches of Cape Cod. It was a very cold, wintery day, I think my family thought I was half nuts, for wanting to go, but they appeased me!! 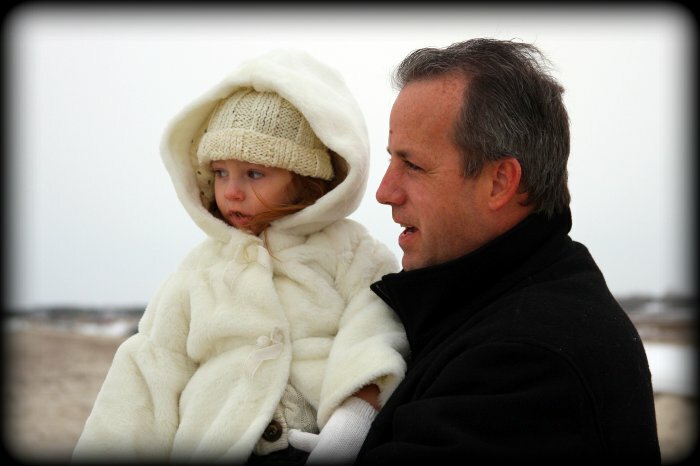 The wind was so wild that Sarah never left the comforts of Daddy's arms. Nick on the other hand was loving life as he ran up and down the beach with Rudy. The day was very overcast and hazy, so the pictures are not the brightest or most colorful, but I think they really depict the kind of day that it was. Snuggling in close to Daddy, so he could shield her from the wind. I love how her little face is just peeking out of her hood!! Sarah and Pat checking out all the sea gulls looking for food in the water. Nick with a snowball in hand getting ready to throw, with Rudy by his side. Guess who he was aiming at??? 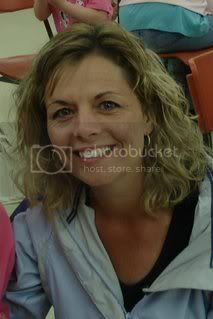 Yes, Me....the annoying Mom with camera in hand!! Where else would you find lobster traps decorated for Christmas....I thought it looked so cute! To me Cape Cod is such a beautiful place.....there is something about it...the incredible views, the ocean air, the people, the food.......it is just a different way of life.....and something about it seems so appealing. Maybe because it is so opposite of where we live......one day I hope that we have a place to call home there.....or at least, "summer home"......It is a dream that both Pat and I have. I am so glad that we made the trip over the holidays. We really enjoyed the time we had with our family and we can't wait to go back. Hopefully we will be heading up for Easter.....at least all the snow should be gone by then!! Love those pics my friend! And your new blog look is fabulous! Made me cold just looking at it! ha! What a great trip...snow at the beach. I just can't even imagine! Hey I noticed that Red Sox hat on Nick...my cousin played for them the last two years. He got traded to the Pirates at the end of this season...we were all very sad. The Sox are way cooler if you ask me...but then again...it is PA! Maybe ya'll could go to a Pirates game! ha! Well, first I must say I love your new look on your blog..it is just wonderful! The quote about "angels" is perfect!!! Beautiful pictures! I love Cape Cod..ever been to Nantucket?it's dreamy! Stunning pics Lisa. It looked cold there, but just beautiful. Love the one of Pat with Sarah and the decorated lobster trap. I also think overcast days are great for taking pics. P.S. How do you get your photos to post so large in size on your blog? :) Hope that's not a silly question. The blogover is amazing, Lisa! I think it is PERFECT! I love these pics. It looks like a perfect winter day. The ones of Sarah snuggled up with Pat are precious. And Nick, well, you know I think he is just a DOLL! 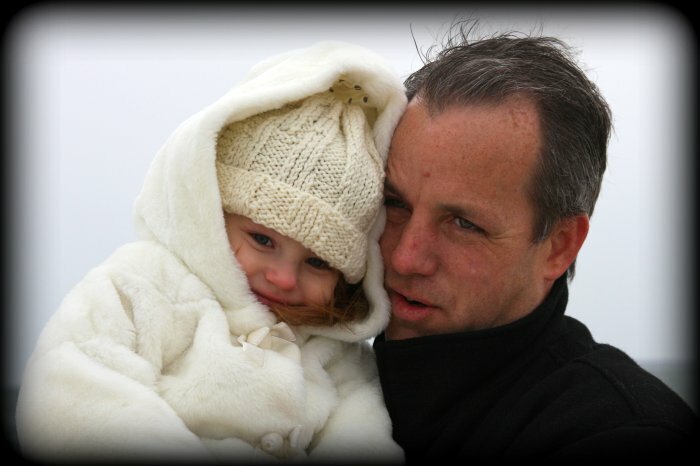 What an adorable picture of Sarah and Pat, all snuggled to stay warm while Mommy drags them to the freezing beach. (just kidding!) And yes, that home is pretty darn spectacular, but I'm guessing I would lose my kids in there. BTW, your blogover looks great! I hope you've been able to check a lot off your workload this week. Only 1 more day until weekend!! Those are GORGEOUS photo's!! I've never been to Cape Cod, it looks so pretty. The Christmas lobster cage cracked me up...we don't see many of those in Colorado, ha!! Your family is just beautiul!! I've never been to the cape before, but now I really want to. It looks so pretty! Your pictures really show the beauty. I love the pretty water, then there's those cute kids too! These just might be my favorite winter pictures yet! I almost shiver just looking at the first picture of Pat and Sarah. They both look sooo cold! That house is fabulous! I think we need to plan a bloggers retreat there! I love your new look too! Beautiful!!!! I'm thinking about you and will type more later. It looks COLD. Beautiful, but COLD. And the decorated lobster pots? Bring back memories. Sigh. Exactly where is Cape Cod??? Beautiful photos! Sounds like you had a great time. 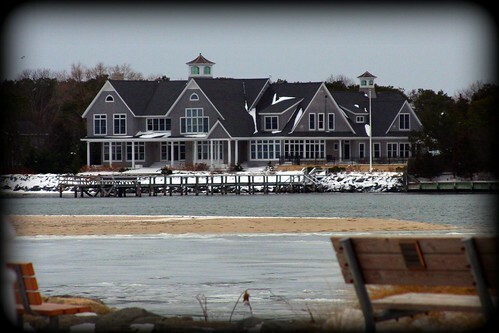 I agree with you about the house across the inlet - I would LOVE to spend a summer there. It looks amazing. I love your new blog, and your photos are fantastic! How are they so big? I have mine set to "large" when uploading, but they are not as large as yours! Fantastic! I feel the same way about traveling to the coast of NC...we go to several different beaches in the summer. I always say that if I win the lottery, the VERY FIRST thing that I will buy is my beach house!!! PS - that house is to die for...how huge was it??? It is amazing. beautiful family you have, Lisa. that is one GORGEOUS house. I hope to visit Cape cod one day! Brrrrrrr! Those are beautiful pics though, your family is just stunning. LOL @ the decorated lobster trap. That house looks AMAZING. And huge. What I wouldn't give for that space! Ooops, forgot to say I LOVE the new bloggy look! Gorgeous photos!! It looks soooo peaceful there in wintertime! Your blog looks fab, by the way! These pictures are amazing! You don't need photography class! I love the shot of Nicolas and the first one of Sarah with Pat. She looks so sweet! Your trip to Cape Cod looks like it was beautiful! So glad you finally made it up there! Your photos are beautiful. 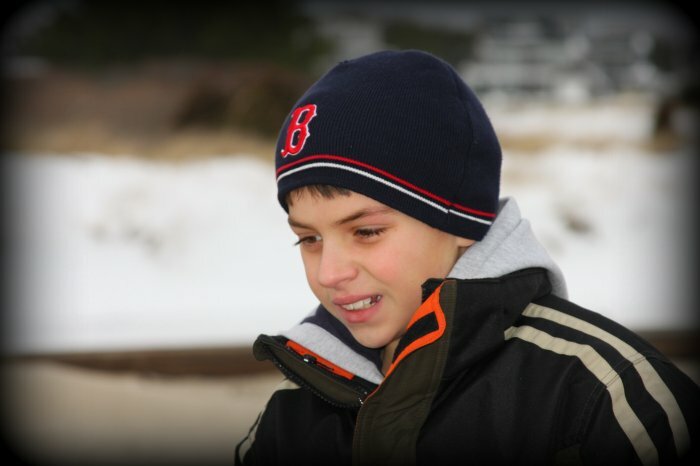 It is so weird to see Nick in winter clothes with a snowball on the BEACH! Cape Cod sounds wonderful. I would love to go there someday. That house is amazing. Would LOVE to spend a summer there! Looks like you had a Great time even though it was COLD..
Love your pictures! Just a bit chilly!! That house is just beautiful~~I definitely wouldn't want to be the one to clean it, though!~~~~it is so big! Although, with a house that size, I am sure that they have a cleaning lady/maid! Looks like y'all had a great day despite the cold. Your photos are great...as usual! Sarah looks precious in all ivory against her daddy's chest. Sounds like a wonderful trip with pictures to match. I love the lobster trap with the red bow too! If you're dreaming of having a house there someday, it will happen! It's all in positive thinking! Have a great weekend! I love winter days on the beach... gives a whole new perspective. Looks like you all had a lovely (cold) time!! Love the pictures!! Thank you for your sweet and encouraging comments on my blog. They really do help. And now my 6AM infusing is about done so I'm going to take my groggy-self back to bed for a little while. The photos are just beautiful and I am sure (I know) you guys had such a great time! BTW...that house is a killer! I so won't mind spending my summer in a house like that! Your new blog look and pictures are gorgeous! I would love to visit Cape Cod one day too! Nice pics Lisa! I would so love to have the same dream, what a gorgeous house! Just gorgeous! I would love to visit the Cape one day. It looks amazing. Have a great weekend Lisa. WOW....looks so beautiful!! These pictures are perfect. I love the new winter theme blog look. We live 2 blocks from the lake and I have to say I don't think I've ever walked the beach in the winter. You've made me think maybe we should try that one of these days!! I hate being cold though, I'm not as brave as you are! I would be like Sarah, tucked inside my coat! Love the little blogover!!! These pictures are wonderful...it looks like a winter wonderland...beach style!!! Okay...had to come back two times to get the word verification right....hessorks to you...may be my fave! I love the first photo!! Great Photos and a beautiful family! I popped over from Journey to Isabella. OMGosh is it Beautiful!!! That house is a DREAM! One of these days I am going to have to go visit that wonder up there! You are so lucky your family is there. Sure looked cold. Oh Lisa... that house is amazing! What beautiful pictures. Going to a beach in the dead of winter was a great idea. BEAUTIFUL pictures. 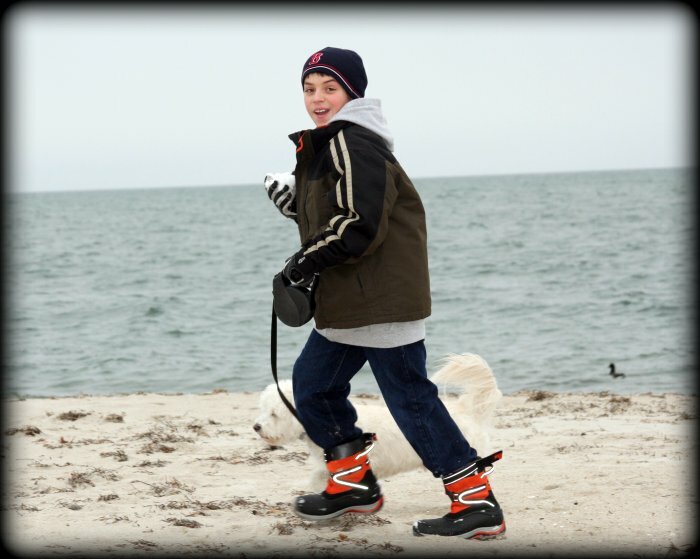 Oh my Lisa~ what great photos that really captured your winter beach time! Looks like Nick had lots of fun running about and Miss Sarah was all snuggly warm, too, and lookin' as cute as ever! And the dream house across the inlet~ amazing! Gorgeous!! How peaceful that must have been being on the beach in the winter. I love the one of Nick running with his doggie. I look forward to following your journey with your beautiful family. Your pictures are lovely. (Brrrrrr!!!) I especially like the one of Sarah in her Daddy's arms. These photos are amazing. You have become a wonderfully talented photographer!!! Sarah and Nick look adorable (cold, but so adorable). I am so glad that your holidays were so wonderful. I pray that 2009 brings new blessing. It looks sooo cold but beautiful. I can totally see why you are drawn to Cape Cod. I love the decorated lobster trap. Looks like you guys had a great time. Wouldn't you love to see the inside of that house? Hi Lisa~ I just posted the answer to your question. Thank you for sending it to me. I am so excited about posting decor ideas but afraid that my excitement and passion will burn out or I will run out of ideas. These are really beautiful pictures...I have always wanted to visit there myself. I came to your blog because you seem to comment on all of my favorite families also...I noticed you because you always have very uplifting things to say to everyone. What a sweet spirit you have. You also have a very beautiful family!!! Awesome pictures. Looks to me like your family enjoyed their time in the cold. Nice pics. I love Cape cod. I've been catching up (seems to be the story of my life!) I love all your pictures. They look so great, and I am completely jealous of the workshop you're going to. It is going to be SO much fun. Beautiful pictures! Love that house too! Wonderful photos ~ The one of your husband holding Sarah with her face peeking out is adorable! 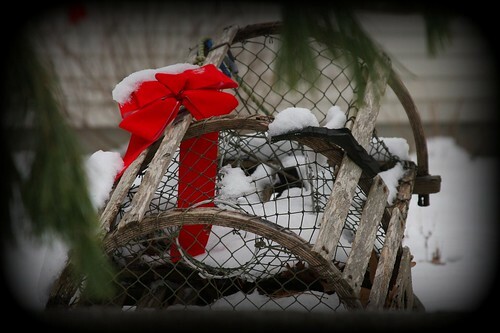 Love the lobster trap ~ we have a few decorated around in Mystic. Cape Cod is beautiful any time of the year. We try to stay away when tourist season is in full swing and enjoy it during the down times. The wintery blog design is perfect for the snowy season. I picked up your BLOG through Gial. I love your pics they are beautiful. Would you mind me adding you to my sidebar? i love your photos, they have captured the beauty of your family and the setting. I love the pictures, so beautiful! We Actually Made It This Time! !